At the end of the day, the only “remedy” for “consumerism” is the self-knowledge to realize what truly contributes to our own flourishing and the virtue to carry it out. The alternative to consumerism isn’t political. It is cultural and even — dare I say it — metaphysical (“A Capitalist Critique of Consumerism“). This is a concise summary of the argument I make in The Cure for Consumerism. The moral problem of consumerism isn’t a problem of too much stuff. Unfortunately, many critics of consumerism assume just this; that we have too much and so we need to have less stuff. As Trentmann (and Gobry) point out, we do have a lot of stuff. And yes, it isn’t too farfetched to say that some of us—even many of us—have too much stuff. But as is often the case, saying we have too much stuff begs a number of questions and os fails to deal with consumerism as a moral problem. Instead, the critique that we have too much stuff uncritically assumes a crude, materialistic understanding of human economic activity. As a result, the proposed solutions (typically, less stuff and more regulations to limit our acquisition of more stuff in the future), undermines moral agency not just in the arena of economic activity but in other areas of human life. “The propensity to truck [i.e., produce], barter and exchange,” Adam Smith says, “is common to all men, and to be found in no other race of animals.” In other words, far from being merely a requirement for our physical existence, there is something distinctively human about economic activity. This is the central point in Trentmann’s analysis (and critique) of consumerism. Human beings are by nature creative and our economic activity is one way in which we manifest or embody our creativity. Moving from bare anthropology to theology, allows us to see our “propensity to truck, barter and exchange” as reflections of the imago Dei. Far from being a matter of a bland, utilitarian need, our productivity is rooted in the human vocation to creativity (“truck”). Shifting our focus from the personal to the social, the myriad economic decisions we make every day are the life-giving fruit of our ability to see the goodness of things (“barter”) and our obligation to do the works of justice (“exchange”). Yes, in a fallen world our “propensity to truck, barter and exchange” has been marred by sin. Sometimes the distinctively human nature of our economic life is so obscured as to be all but invisible. At the same time, no matter how much sin has wounded human goodness, the wound is not so severe as to destroy our humanity. Though damaged by sin, the goodness of our humanity remains and so therefore does the goodness of our economic activity. And this is also why the moral problem of consumerism isn’t so much a matter of how much we own or consume but the goal that we pursue. Let me explain. Our consumption shapes not only the world around us but also our character. A purely materialistic view of consumption tends to focus only on what we use. Whether we are capitalists or socialists or some blend of them both, a materialistic approach to economics—and so ethical analysis of economic decisions—is inherently, and unavoidably, a zero sum game. What I have, I’ve taken from you because and what I use is gone forever. In response to this, I might settle on a life of greedy acquisition. I do what I need to do to get what I want and to keep it. While this might sound like capitalism it is just as applicable to socialism (or a mixed economic system). In all three scenarios, consumption is understood as purely materialistic. What changes is not the fear of depravation but the social mechanism that structure competion for ever diminishing resources. Let me suggest a different, hopefully more fruitful, way of thinking about consumption. Seeing consumption as the goal production means that consumerism is about having too much stuff. But what I would argue is that consumption is (or at rather, ought to be) in the service of production. We consume to create more material and social wealth. 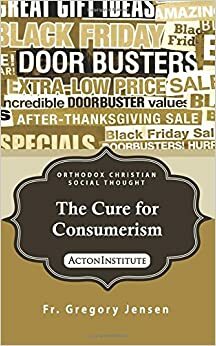 This means that what we need is not materially less consumption but morally better consumption, that is consumption that “truly contributes to [human] flourishing”; not only mine but yours. But what it doesn’t mean is for human beings to consume less. Not because we sometimes don’t consume too much—we clearly do—but because over-consumption and consumerism are fundamentally matters of human moral and not (simply) materialistic problems. ← What Is Salvation For?